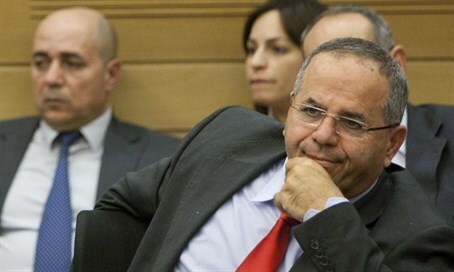 Deputy Regional Development Minister Ayoub Kara (Likud) was one of several MKs in the government on Friday to condemn the eviction of Jews from two buildings bought in Hevron, and demand that the step be reversed. Security forces on Friday morning began evicting the 200 Jews who took residence the day before of the strategically located buildings, after having bought them in full from an Arab seller. Sources close to Defense Minister Moshe Ya'alon (Likud) said Thursday that the purchase did not receive required political approval. In response, Kara, together with Likud MK Oren Hazan and Jewish Home MK Bezalel Smotrich, threatened to no longer support the narrow coalition government, which is made up of a minimum 61 MK majority meaning one MK could bring it down. Kara, himself Druze, said, "it is forbidden to remove Jews from their homes, and there will be ramifications, we demand the involvement of the Prime Minister in the matter." Immigrant Absorption and Jerusalem Affairs Minister Ze'ev Elkin (Likud) added his criticism to the move on Friday, saying, "this is a time to fight terror and support the strengthening of the settlement, and not to fight the settlers." "Those who speak in the name of law and order are invited first to deal with members of the Palestinian Authority and radical leftist activists who execute Palestinians who dare to sell land or homes to Jews," he added. Also condemning the move was Smotrich, who said, "the eviction of settlers in Hevron would appear to be a 'local issue,' but it obligates a clear line being drawn, clarifying that we are not ready to enable coalition conduct in which a Defense Minister determines by himself the policy in Judea and Samaria, and we are forced to accept it and remain essentially without influence." "We are part of this coalition, and our position must be heard and taken into account," said Smotrich. "Yesterday most ministers and MKs of the nationalist camp welcomed the Hevron settlers, and called on the Defense Minister to allow the population of the houses. The Defense Minister's (choice to) ignore the rest of the coalition members comes after he also ignored our position regarding the closure of the Jewish Consciousness branch from the military rabbinate, and also in other matters, and we must not agree to this." Smotrich's words come as members of his party in the Jewish Home Forum in Samaria criticized the coalition government Friday, demanding that Jewish Home chair Naftali Bennett take some action against the eviction.